Hundreds of thousands of men and women have experienced the benefit of Botox and indeed, Botox injections are the most common procedure performed at our clinic for both men and women. It is an affordable treatment that can yield natural-looking results. Botox is a natural, purified protein that tends to block impulses from the nerves to the tiny facial muscles responsible for the deep muscle pull creases; consequently, the muscles relax so the undesirable creases gradually fade away. After treatment, the overlying skin usually remains smooth and unwrinkled while the untreated facial muscles contract in a normal fashion, allowing desirable facial expression to be unaffected, yielding a natural rejuvenation. 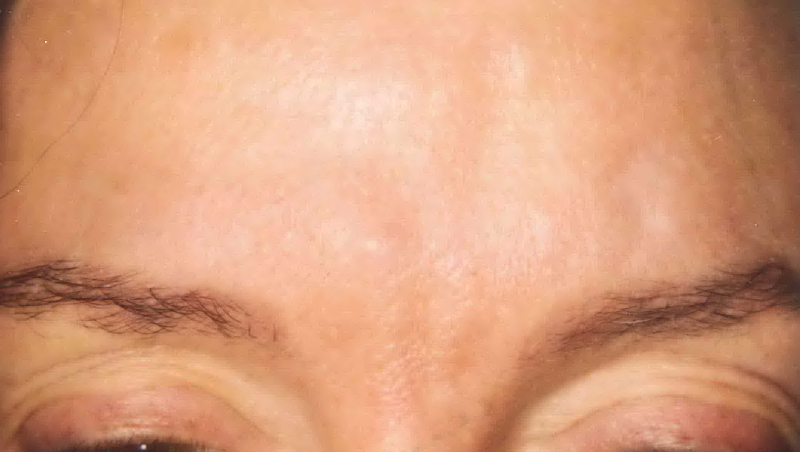 Which Areas Can Be Treated With Botox ®? 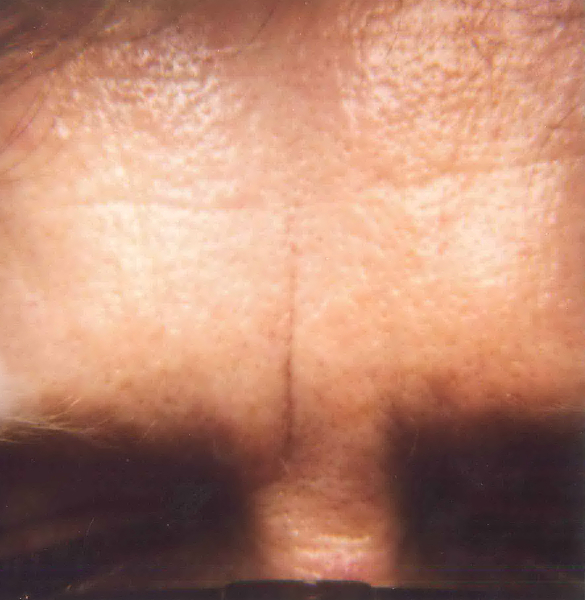 The most common area Dr. Nakatsui treats is the glabellar furrows–the vertical wrinkles that appear between the eyebrows. These are the lines that make one look angry or concerned even when happy. 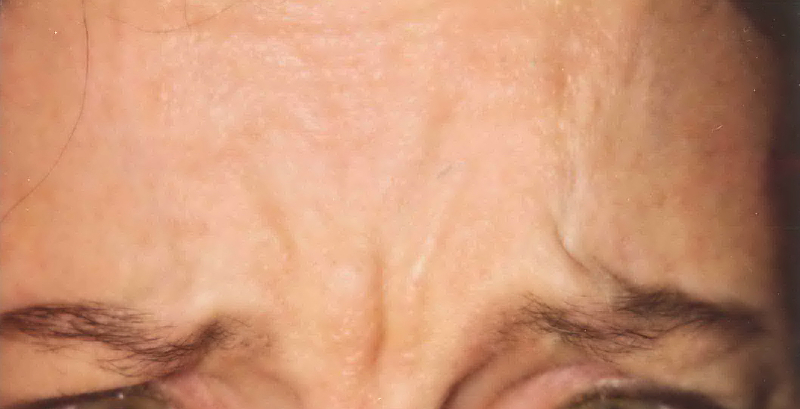 After treatment, these frown lines normally fade yielding a more pleasant and more youthful appearance. 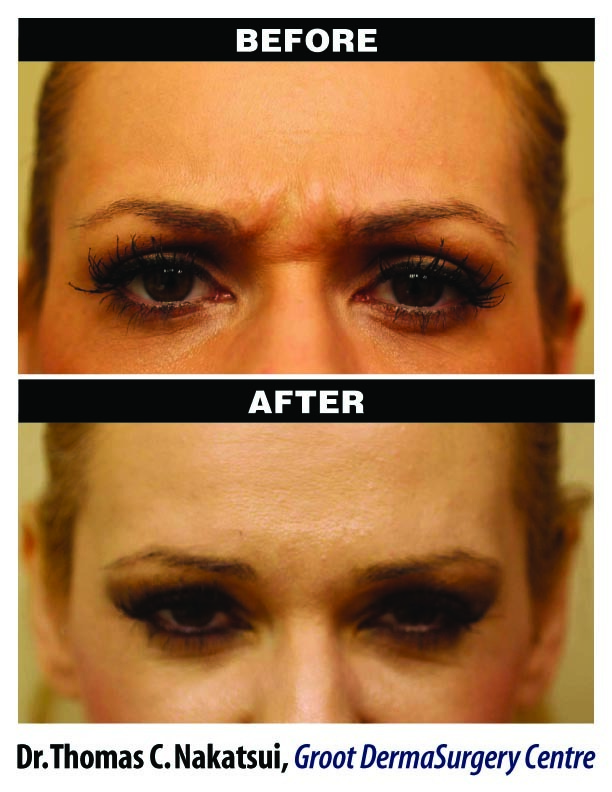 In addition, Botox can be used to lift the brows slightly. 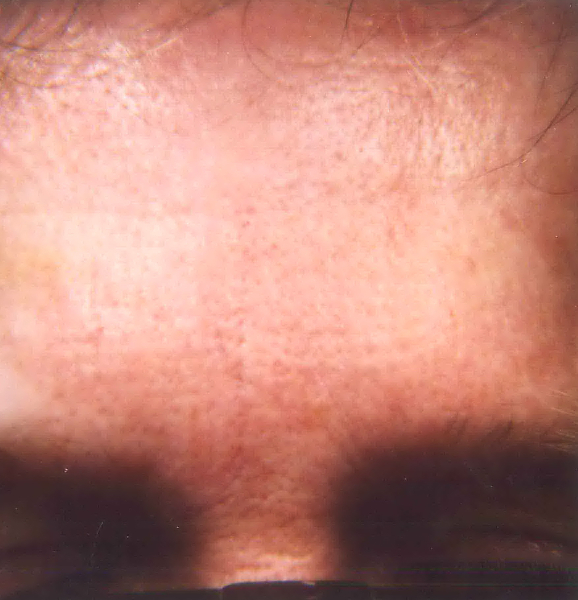 The crow’s feet around the eyes are another commonly treated area and these aging lines usually respond very well to muscle relaxant injections. Botox can also be used to treat bunny lines and dimpled, uneven chins and can even be used to shrink the large masseter muscles of the cheeks. However, not all patients are candidates for these treatments. For example, some patients will get heavy brows from injection of the forehead. After a consultation with Dr. Nakatsui, he will best be able to decide which areas should be treated and which should not. 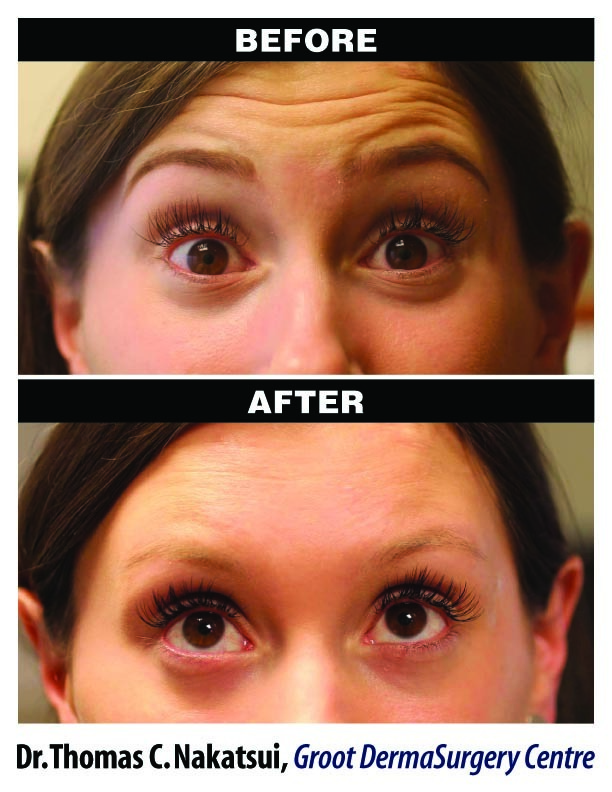 Does A Nurse Perform The Botox ® Injections? Dr. Nakatsui personally performs all BOTOX COSMETIC ® injections. Unlike many other clinics and spas, there are no nurse injectors for fillers or Botox at the Nakatsui DermaSurgery Centre. What is involved in Botox injections for Wrinkles? Botox injections are simple and safe if done correctly. Using a tiny needle, a very small amount is injected, very precisely, into the target muscle. There is a slight burning sensation as the fluid is injected. However, no anesthetic is required and normal activities can be resumed immediately, with the exception of bending over for a few hours after treatment. In many individuals, the results may take up to 10 days to take effect. The effects will last about three-four months on average, and the muscle action will return. The duration is determined by the individual’s rate of metabolism. When the undesirable creases begin to reappear, another injection is all that is necessary to maintain the desired result. You will need to have injections three to four times a year to maintain this positive effect. Some studies have shown that the duration of the treatment benefits increase over time. The length of time the treatment lasts varies from patient to patient. Can Botox be combined with fillers? Yes. Botox and fillers are often injected on the same day. This is often referred to as a Soft Lift ™ and it refers to the use of Botox in combination with fillers such as Juvederm and Restylane at the same visit. A combination of these two injectables can give a more rejuvenated look than either one alone by treating the face as a whole, smoothing away lines, restoring lost volume, and enhancing facial contours. Dr. Nakatsui has performed over a thousand Soft Lift ™ procedures on patients interested in non-invasive treatment to rejuvenate the appearance of the face. 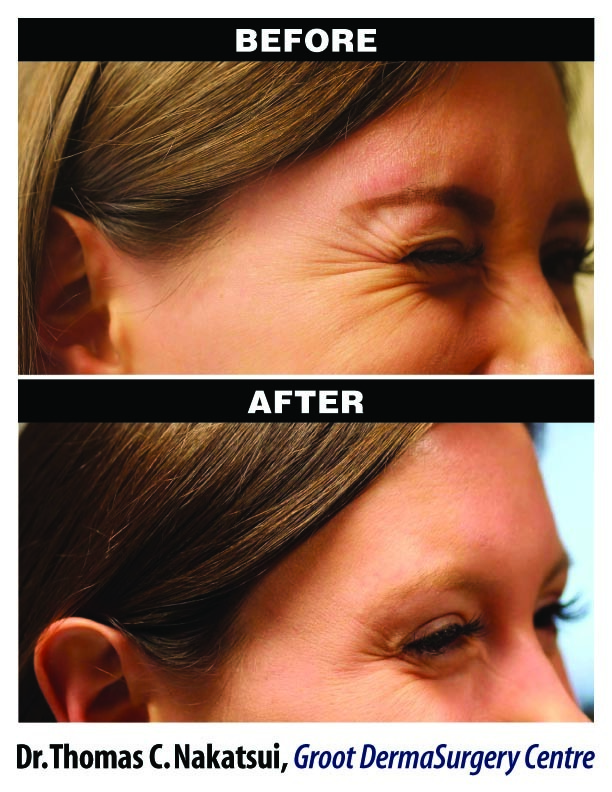 Botox injections are effective in treating some muscle pull creases, but not all of them and the results are temporary. The injections will not improve the quality of the skin, such as fine wrinkles, texture changes, or uneven pigmentation. Treatment options for improving the quality of the skin include the 3D Rejuvenation Program, Pearl Fractional/Fusion treatments, and laser resurfacing. Botox injections will not improve sagging and redundant skin. Lifting procedures are necessary for these conditions. Description: Injection of muscle relaxants such as Botox into facial muscles tends to inhibit muscle action; thereby can decrease dynamic wrinkles. It can also be injected into the underarms to control excessive sweating. Average Cost: Muscle relaxant injections for treatment of dynamic wrinkles cost $230.00 per syringe. Recovery Time: Immediate; results seen within 3 to 10 days. Treatment Frequency: On average two to four times a year depending on how quickly the muscle relaxant metabolizes. Risks: Bruising, numbness and burning during injections. Eyelid droop is possible, but rare and temporary. Botox appointments can be made by calling the office at 780-482-1414. For your convenience, Botox appointments can also be booked directly online. There is a $100.00 refundable deposit required to reserve an appointment using the online booking service (please note there is a $20.00 administrative fee deducted from this deposit). If you cannot find a convenient time using the online scheduler, please call as there may be additional appointment times available that are not visible online.